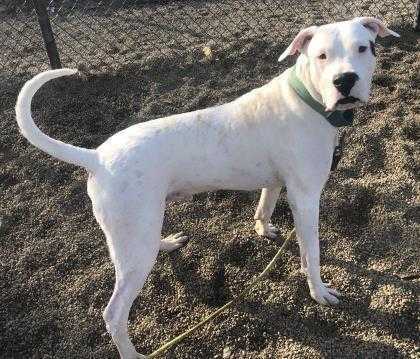 Brutus is currently living the foster life in Bowling Green, OH but he recently told us he is willing to travel and adopt a new family! He is ready for adoption and looking for a family that loves to play, walk, run, and be active. At 115lbs and 11months old this dogo is a big mush that like to make his human laugh. Right now everything is fun for him yet he knows how to behave when told to. Brutus is housebroken and crate trained along with knowing how to behave indoors. The foster was perplexed as to why a dog like him ended up surrendered to the shelter. Well, someone gifted him as a puppy to an older couple who couldn't keep up with the puppy energy of a dogo! No fault of his own for sure but we are sure glad to have him in the rescue! We all love the little spot by his right eye that seems to add a little to his character! Brutus says he would really like a backyard because his foster says he loves to run and play like a wild man! However, he calms down when inside and behaves like he should. He has requested that his new parents have lots of toys for him because he loves playing with toys! On his first outing he got to meet a man in a wheelchair and that didn't phase him one bit. The man welcomed the attention so Brutus made sure to give him a dogo facial and everyone was happy. He truly made that man's day and showed what a good boy he is and how is sweetness can really comfort people. If you are interested in Brutus please apply and we will be screening applications to get him into a new home!